Thinking about refreshing your living space or giving your bedroom a facelift? The look and feel of a room can define whether it’s a tranquil haven or vibrant hub. But creating a new look doesn’t have to stop at the wall colour, the flooring or soft furnishings. Your internal doors can play a key part in achieving a new season makeover, too. If you’re looking for inspiration, here are our top trends for summer 2018. This summer’s hottest palettes include 50’s inspired ice-cream shades and deep indigo blues. It looks like ever-popular grey is here to stay, too – with dove greys and silvers the focus for the sunnier months. 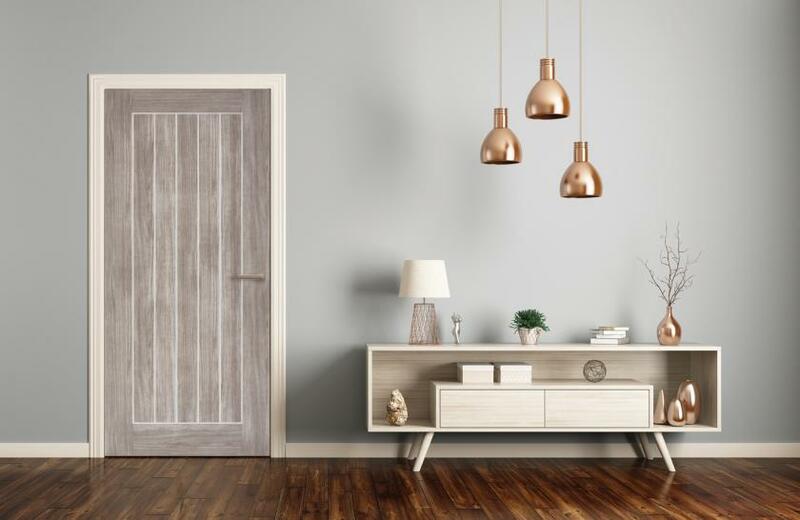 But whether you go for retro inspired shades, deeply dramatic tones or pale and interesting hues, it’s good to know that the latest trend in internal doors – laminate doors - will provide you with a perfect finishing touch. A contemporary must-have with a wealth of benefits, laminate interior doors offer fashion’s go-to colours, at a price that won’t blow the budget. They come in a range of colours and wood effects to suit all styles - but ivory and grey are the big players for this season. Cool ivory is modern yet timeless, complementing on-trend pastels as well as more dramatic colour schemes. Three shades of grey – light, medium and dark – create a fabulous fashion backdrop for blue interiors, or a blend seamlessly with your on-trend grey space. As well as offering the latest style, the best thing about ivory and grey laminate doors is that they not only go with this season’s trends, but will also dovetail with almost any colour scheme in the future. Ivory laminate doors work in a classic or contemporary home, while grey doors are an essential for anyone looking to channel a cool, minimal vibe. So when it’s time to update your room with a new wallpaper or paint colour, you can relax knowing that your doors will still look great. Why is it that laminate doors are proving so popular? Aside from their affordable price tag and the wide range of colours on offer, they are also amazingly practical. A hard wearing and sturdy choice, they’re ideal for busy family homes - a quick wipe with a damp cloth will keep them looking as good as new. The laminate finish emulates a wood grain - with none of the variations that you get from a veneer. So a big benefit is that they provide a consistent colour across every door for a seamlessly stylish effect. If you’re yearning for a bright space, consider a glazed laminate door. These are a great way to flood a living room with sunshine, or to illuminate a room that has limited natural light. With a range of laminate door styles, from the sought-after five panelled to a more timeless grooved look, not only can you pair your on-trend room with a door in a fashion colour, but you can select a style that dovetails with the design of your home, too. So whether you love to follow trends or you’re simply looking for some style inspiration, think about a laminate internal door for your home. Don’t forget, you can choose your preferred style of handle, too, to give your doors a personal twist.